What’s better than two-doors? How about four-doors. That is exactly what makes this 2018 Jeep Wrangler Unlimited as special as it. Not only do you receive all of the normal Jeep Wrangler attributes, but you can bring the whole family along! Four-doors means more adventuring with friends, more long-trip storage, and honestly, just more Jeep Wrangler, and who doesn’t want more of what they love? After 75 years, Jeep has continued to give you the Wrangler that you’ve loved while adding modern technology and modern comforts. This 2018 model packs a punch with off-roading capabilities, specials editions, and as always, the unique style that can never be forgotten. How many safety features are offered with the Wrangler Unlimited? To further enhance your driving experience in the 2018 Wrangler Unlimited JK, you need more than just power, performance, and style. Jeep is bringing you over twenty-four different security and safety features. Some of these features include trailer-sway control, hill-start assist, electronic roll mitigation, brake traction control, and electronic stability control. Safety is a top priority, and with even more people able to climb into your Wrangler, safety becomes even more vital! What are the design options for the Wrangler Unlimited JK? There are many different model options available with the Wrangler Unlimited. There are four different models, Sport, Sport S, Sahara, and Rubicon. There are also ten different exterior color options to choose from, and three interior colors! Additionally, 2018 is bringing you three new Editions, the Golden Eagle, Freedom, and Altitude. Each of these editions has their own different themes to set them apart, and to set yourself apart. The Golden Eagle features Light Bronze accenting, along with Low Gloss Bronze wheels, throats, badging, and headlamp rings. The half doors and soft top are both tan in color, and the steel rear and front bumpers come with bronze tow hooks. The Golden Eagle logo can be found on the front seats, and on the side and center hood. The Freedom Edition has a military theme. This theme can especially be seen with the Oscar Mike logo that can be found on the seat backs, as well as with decals and badges on the hood and fenders. To further accent this edition you’ll find a premium black soft top, and silver accent stitching on the doors, front armrest, and the leather-wrapped steering wheel. You’ll be feeling very patriotic while driving this unique Edition. The Altitude Edition is sleek, giving you High Gloss Black throats, front and rear bumper appliques, and headlamp rings. You will also receive standard black leather seats that are complemented with Diesel Gray accent stitching, and a power bulge hood to show that you mean business with your Wrangler Unlimited. What is under the hood of the Wrangler Unlimited? What exactly is under the hood of this legendary SUV? The answer is a Pentastar 3.6-liter V6 powertrain that can generate 260 pound-feet of torque and 285 hp! This powertrain has a specific focus on lower-end torque to help produce a better off-roading experience. Other things that help set this powertrain and vehicle out, from the rest of its competitors, are the best-in-class angles, like the 42.2-degree approach angle, and the 32.3-degree departure angle. Along with this, there are three different axle gear ratios available, the 3.73, 3.21, and 4.10. These options give you better optimization and capability. 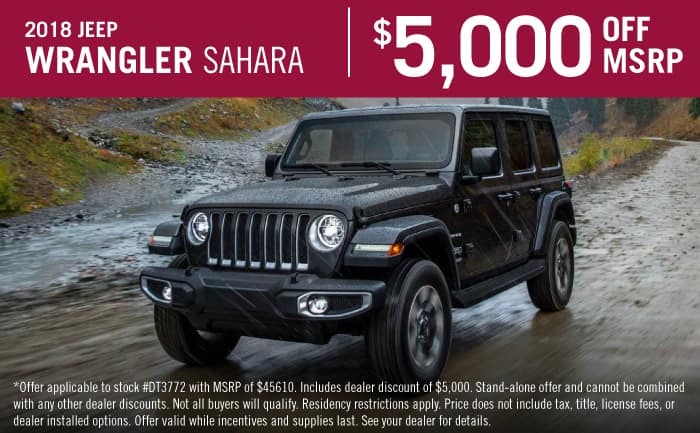 The Sport and Sahara model options give you access to an optional Trac-Lok limited-slip rear differential that gives you, even more, torque and grip, especially in those environments with low-traction. The Jeep Wrangler Unlimited JK has everything you could possibly need, from off-roading capabilities to four-doors and added interior space, what more could you ask for? Stop by our dealership today for a test drive!